Microsoft släppte precis ett exempel på hur man gör en LOB-applikation för mobila enheter. Det är ett exempel med fullständig källkod. Kan vara kanon för dig som jobbar med sådana här saker. Ladda ned hela exemplet här. Henrik jobbar för Microsoft och är bland annat ansvarig för Windows Mobile. Detta är en intervju där vi diskuterar mobila tjänster, häftiga telefoner, ActiveSynk mm. Och jag som precis skrev att jag skulle skaffa mig en HP. Nu blir jag osäker. 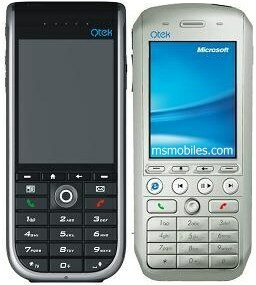 msmobiles.com - 2 new Microsoft smartphones announced : Qtek 8300 and Qtek 8310 - both with built-in Wi-Fi and Windows Mobile 5.0 ! Detta är nog 2000–talets variant på Tamagotchi. Det är knappt att man tror det, men det verkar vara sant. Palm håller på att testa Microsofts mobila operativsystem på sina handdatorer. Detta har de själva erkänt. Microsoft och Palm har ju under en längre tid, nästan i tio år nu, varit bittra konkurrenter. Men sedan Palms andel av marknaden har sjunkit kraftigt, så har de tydligen börjat tänka om. De har också delat upp företaget, så en del står för hårdvaran och en del för mjukvaran. Detta gör det möjligt att göra sådana här saker. This is a quick start article that will show how to build a SMS application in your SmartPhone with help of Compact Framework and OpenCFNET. You need besides Visual Studio 2003 and a SmartPhone, to install the SDK for SmartPhone and the components from OpenCFNET. But don't worry, both are free of charge. 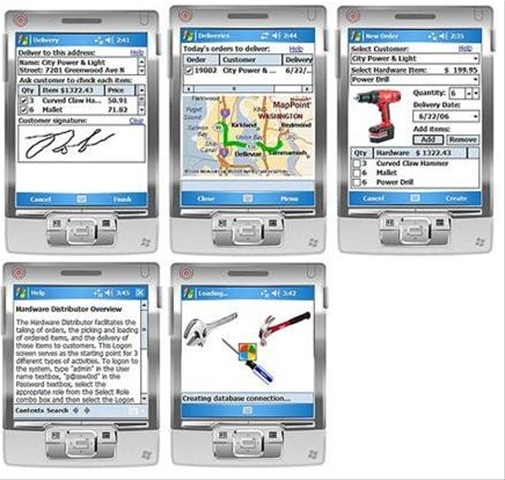 Choose to build a windows application and the platform should be SmartPhone. When you have done this a new project will be created and it's time to start build our fancy application. But before we start building our user interface we must add an additional reference to our project. We need support for SMS. Choose Add Reference and browse through the list until you find OpenNETCF.Phone. Choose this component and click on "Select" and thereafter "OK" to add it. Now, let's build the user interface. It is not so advanced. Put two labels and two textboxes on the form. Change the name of the first label to "Phone number" and the second to "Message". 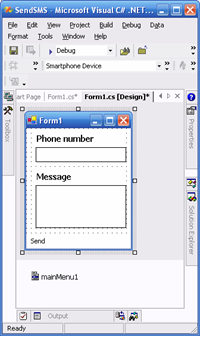 (You could enter a phone number in the first textbox if you don't want to enter it later when you run the program.) Change the name of the textboxes to textBoxPhone and textBoxMessage. The last control to add is a menu control. Add it and make one menu item with the name "Send". Now is the time to do some programming. Double click on the menu item that you have created earlier. The code for the click event for the menu item will automatically be created for you. This is the only code you need. In my example I use C#, but it's a no-brainer to convert it to Visual Basic. The first command will create a new SMS object. 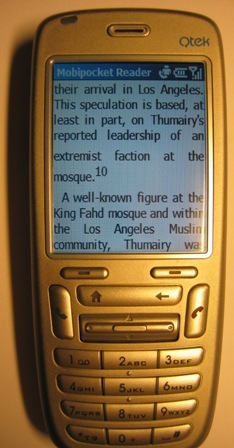 The second row makes a SMS address containing the phone number that the user has entered in the first textbox. Be aware that the second parameter tells the method that the number should be entered as an international number. The third command does the job sending the message that is entered in the second textbox. After this we just close the SMS object and show a message that confirms the action. This application will not run in the emulator because we have to send SMS. This is not supported in the emulator. To run the application in the phone you have to change the device from an emulator to the "Smartphone Device". After you have done that and connected your Smartphone you press F5 to run the application. The program will now compile and be deployed to your phone. All my "free" time right now do I spend preparing the presentation that I will have next week. This weekend I have finished the more boring parts. Right now I'm coding the web service. That's more fun. - How to implement a service oriented architecture. - How to design according to the principle "contract first". - Schema libraries. How to use Xsd in the real world. - Distinguish between user interface and user processes. - How to build a multi user interface and multi operating system application. - SmartPhone - "Hello World". - What could you do with Compact Framework and SmartPhone. This presentation is free. Please go to the Sweden .NET User Group home page if you want to register. The presentation will be held in Stockholm, at 17.00, on the first of December. I have always been a fan of reading books on hand-held computers. I have done it since I owned my first Palm. I have to admit that probably more in love with the technique than with the books I read. In Sweden, and I also hope, in other countries, you can borrow an electronic book from the library. The only restriction is that you must have a library ticket. I found that my favorite program for reading, MobiPocket, has a reader for Smart Phone. That's nice. I have been using it for a while now and it works great. The only negative thing is reading books drain my battery. It has to do with the long use of backlight when reading. It has several nice functions that I enjoy. You cold rotate the text in all four directions. You could also choose in which size the text should be displayed. If you don't have the library where you could borrow them, you have to find them elsewhere. 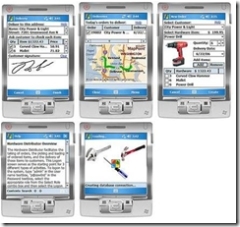 MobiPocket has a shop, but a colleague to me recommended FictionWize. This is a big on-line store for electronic books. This month I will concentrate my free time to develop a SmartPhone application. I will do that together with a friend. We do that because I should prepare to show this application in a talk that I will do in December. But it's not only about SmartPhone and user interface; it's more about architecture, and especially SOA. I hope that I have enough time to write some of my conclusion here, on my blog. But first, here is a brief introduction to the application. 2) We split the user application in two separate layers. One is tied to the user interface and one is agnostic to the user interface. This is often called User Interface Process, UIP. Because the SmartPhone is a device that has the possibility to be both on-line and off-line, we need to support both states. In Chronos this means that the user should be able to register both times, new customers and/or projects without to be connected to the web services at the backend. We have to build functions for caching the data and synchronize it, automatic or manually, with the web service. Chronos gives the possibility to register times, down to a minute. One day could have unlimited times registered. Each registration is assigned to a customer and project. And each registration has also a note field for optional description text. The main screen gives an overview of times that are registered for a week.